WyzMindz resources supported by our proprietary Business Analytics tools enables our customers with “Actionable Intelligence that is “Here & Now”. 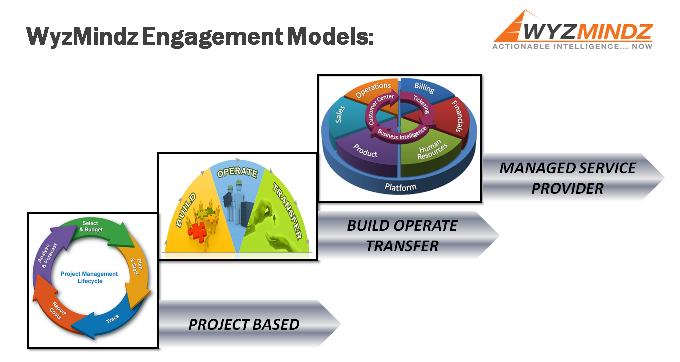 Our unique operating model ensures that we implement what we propose; the mantra is “We do it for you”. Flexibility & customization is the way of our engagement. Our deployment methodologies provide following flexible options. Customers can either choose “Managed services approach” (MSP) or “Build-operate-upgrade-transfer” (BOUT) approach. This is a typical and common approach for deployment of Managed Services, whereby clients do not need to build or invest in any internal support structures, and still avail planet class practices and benefits of maintaining an elaborate “in-house” support structure. In this approach, the Dedicated Account Manager is stationed at the client site for the initial period of the engagement till the processes and data flows are stabilized, while the Dedicated Client Support Teams will function out of the WyzMindz Delivery location. The Account Manager utilizes the WyzMindz Delivery Engine to deliver on the contract deliverable, and also manages client relationship with key stakeholders in the client site. The Account Manager can also be used by the client to engage in discussions and reviews with their clients, if such a need should arise. For clients that do not want to completely do away with an “in-house” structure, we propose the BOUT approach. Under this approach, our Account Manager will assess the current in-house team for their skills and capability, and will work with them to create a planet class support structure. In this approach, WyzMindZ will operate and manage the delivery from customer’s internal teams, and will up-skill them in identified areas over an agreed time frame. Our Project Based Approach is especially suited for the SME & MSME sector. You have a problem in an area that is non-core but business essential & if you are looking out for domain experts to do it for you once; we can build a project plan to help you address that problem statement, transfer knowledge to your key team and move on to next business problem. The flexibility of a small contractual period, quick addressal of the issue, solving multiple business problems in chronological order & Invoices that are problem specific helps businesses optimize the cost of ‘Optimization & re-engineering drive’.